It’s not all meat and potatoes… well, I mean, there is a lot of that, but it’s really, really good! Why get it: Germans do potato particularly well – there’s a lot more to it than mashed potato with meat. 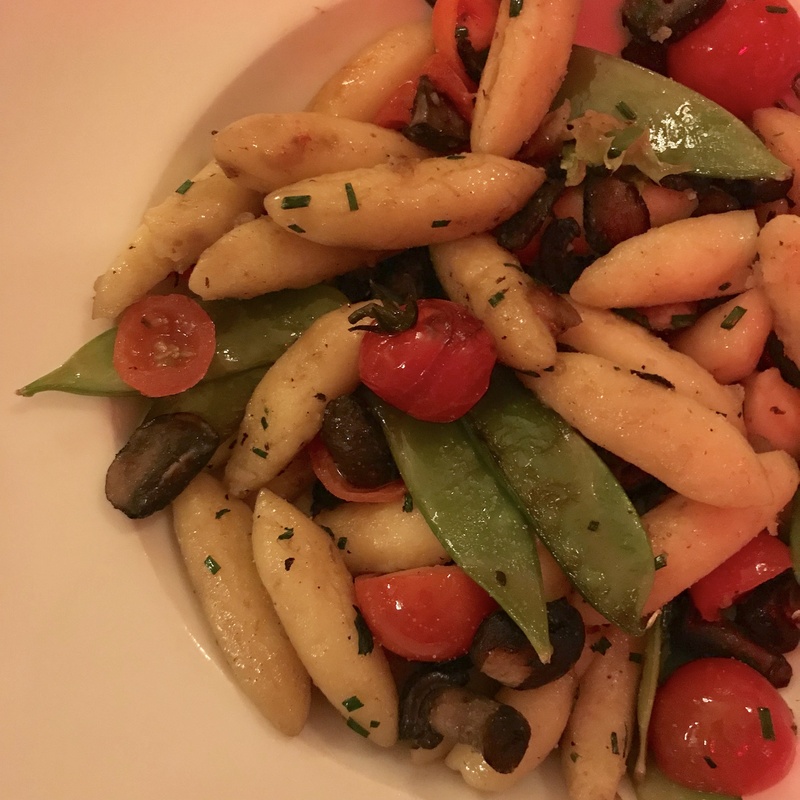 Dishes like this one from Zur Rose make it a kind of replacement for pasta, without making it just like gnocchi. Why get it: When you’re travelling through Germany in winter, you want warm, hearty comfort food. That’s goulash with the aforementioned mashed potato. 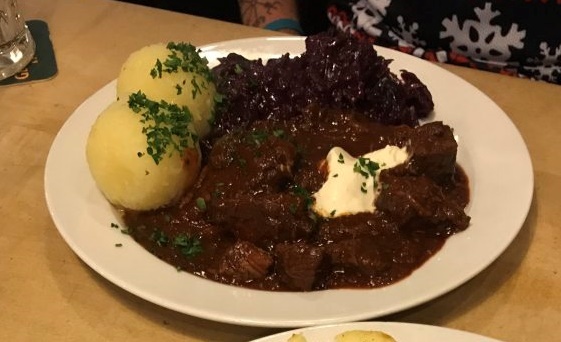 It may look like dog food, but the meat is fall-apart-in-your-mouth soft, the sauce is rich, the sauerkraut is the perfect food to cut through the richness of the goulash, and mashed potato is always a welcome addition. 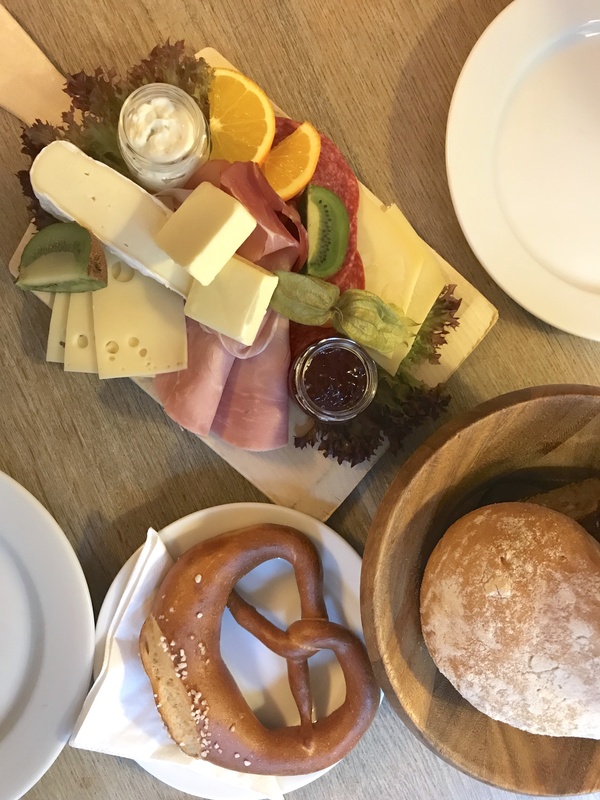 Why get it: It’s not all rich, hearty food – places like Alpenstück are breaking the stereotype with some really basic but delicious options for the modern traveller. Everything is so fresh and simple, it’s the perfect change from the typically heavy meals you’ll eat later in the day. Why get it: For that heavy meal later in the day, you can’t beat a crispy-skinned pork knuckle. 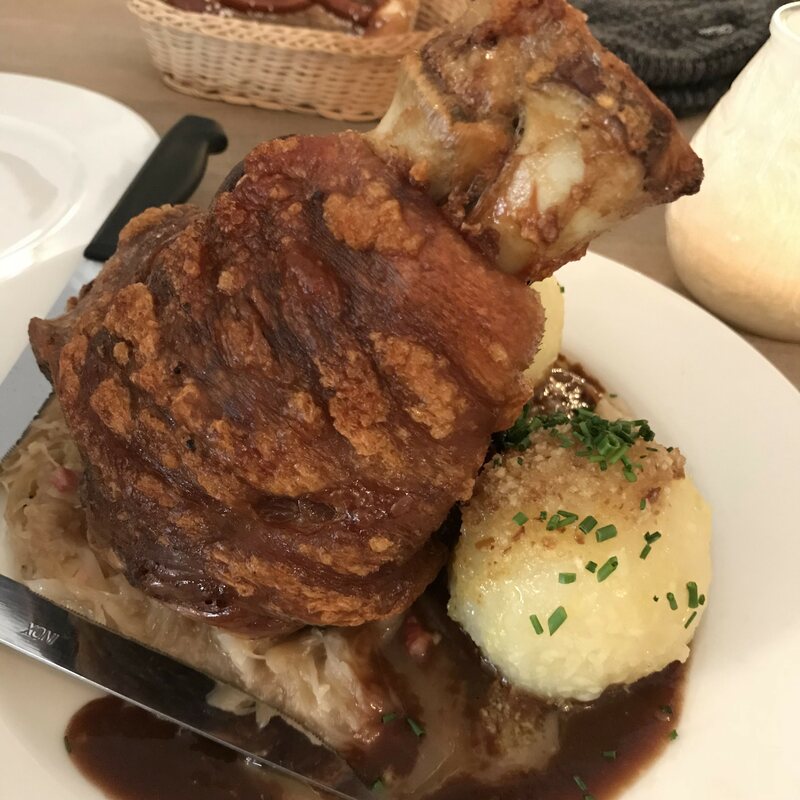 This is the quintessential German plate of meat: juicy, soft pork under a crispy, salty layer, sitting on yet more sauerkraut with a side of yet more mashed potato. Sounds like it’d be getting repetitive, right? Wrong. Why get it: After all that meat and potato, you’ll be wanting some sugar to balance things out. And Germany does sweets just as well as they do meat and potato. 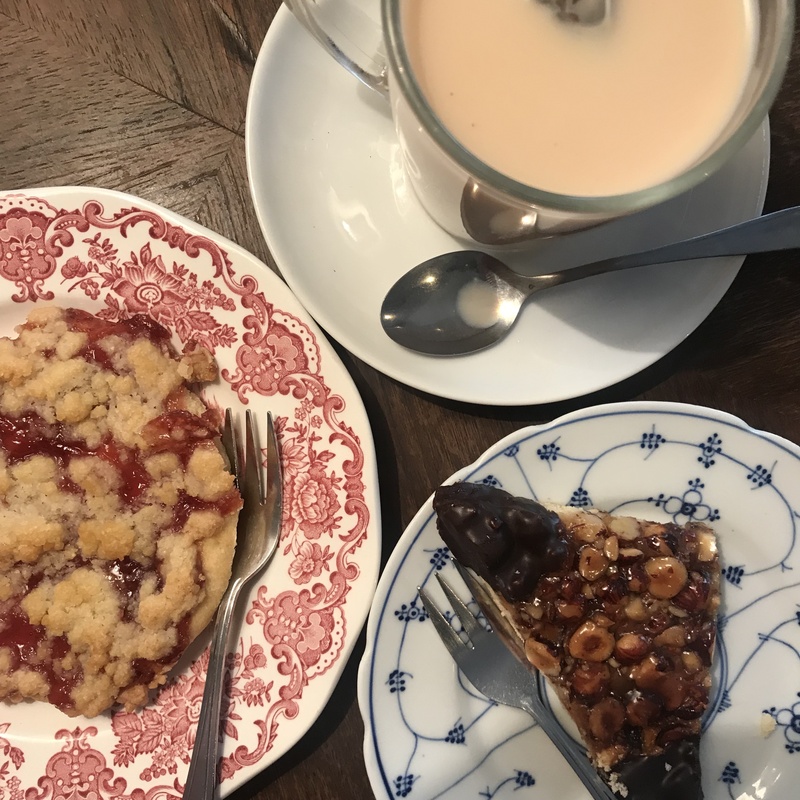 Some delicious options to look for are strudel biscuits – basically a jam covered butter biscuit with ‘crumble’ on top, and nussecken, an absolutely delicious nut/apricot jam/chocolate concoction (click on over to get my recipe for them!) that you really have to try. The objections people will come up with when you tell them you’re following your dream to escape it all are always the same. “What about your job?” “Who’ll pay your mortgage while you’re gone?” “Aren’t you a bit old? 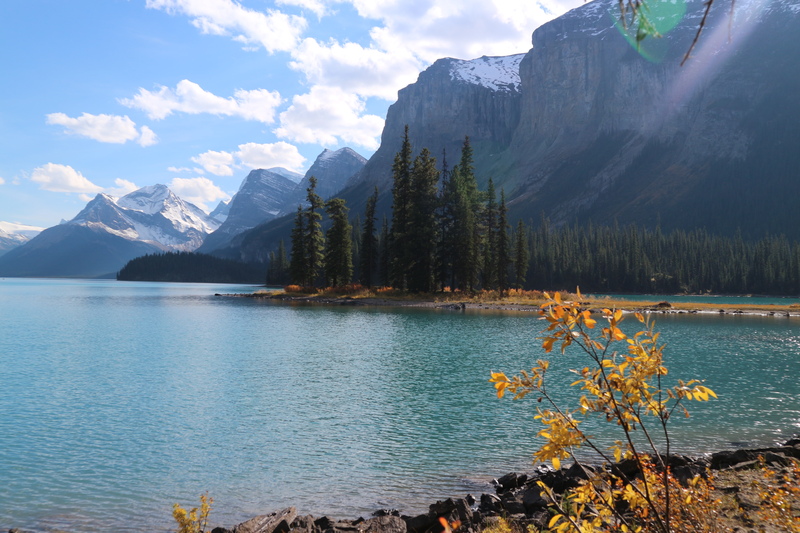 Isn’t it time you settled down?” All valid, responsible, grown up points that, ordinarily I would take pause to consider. But, whether it was divine intervention, a quarter-life crisis, or the warning light of an imminent nervous breakdown, I finally hit my responsible adult threshold a few years ago and started taking my dreams a bit more seriously. I think it was the sheer number of miserable ‘coulda, shoulda, woulda’ people I saw around me that set it off. It is so easy to talk, so simple to say “if only,” “one day.” And its polite to smile and nod along when people talk about the fantasies you both know they’ll nevet fulfill. It’s the gracious thing to do, to raise a toast over the dinner table as your dear friend, fueled by a little liquid courage, announces their desire to quit their office job, escape the rat race, and finally pursue a career as a musician. We lift our wine glasses with a pitying smile for the poor fool. But once in a while, a flight of fancy sprouts wings. Someone quietly works away on a dream when no one is paying attention. They’re planning out logistics, squirreling away money, formulating plans and contingency plans, all in the name of escaping it all. Maybe its a temporary escape, maybe its forever. Regardless, it does happen. It happens behind closed doors with quiet confidence, while others go on belly-aching and complaining that it simply can’t be done. For months I took great offense to everyone who doubted me when I said we were taking four months off life to travel the world. I got angry when they questioned the state of my career, finances and maturity. What I didn’t understand until we got on the road was that they weren’t actually questioning me at all. They weren’t really losing sleep at the thought that my husband and I might struggle to meet our mortgage repayments. They weren’t actually concerned that our jobs wouldn’t still be there for us when we got home. They in fact did not worry that we were being immature and irresponsible by up and leaving. They were suddenly very aware of the fact that they weren’t willing to do what it takes to turn their own dreams into reality. Their raises eyebrows weren’t about me at all. Asolo is one of those little towns up in the foothills of the Dolomites that you picture when you think to yourself “how gorgeous it must be to hire a car and just drive and explore little medieval cobblestoned villages.” Dating back to pre-Roman times, Asolo has been around for a very long time, and hopefully won’t be going anywhere soon. And getting there is as easy as leaving the Venice islands for the mainland and hiring a car. 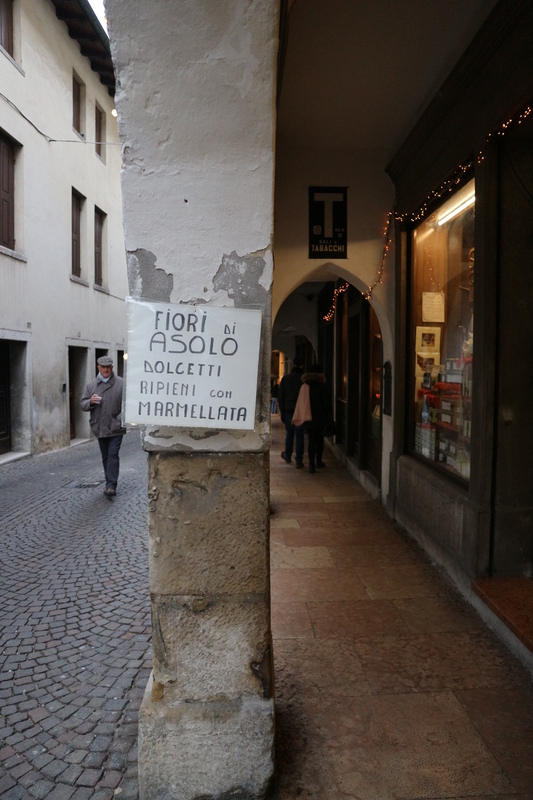 Asolo is one of those towns that managed to retain all of its old-world charm while Venice was being slowly commercialised and destroyed by tourism. They don’t get a heap of visitors, comparatively, and it’s so much more beautiful for that (so if you visit it, please do so respectfully!) 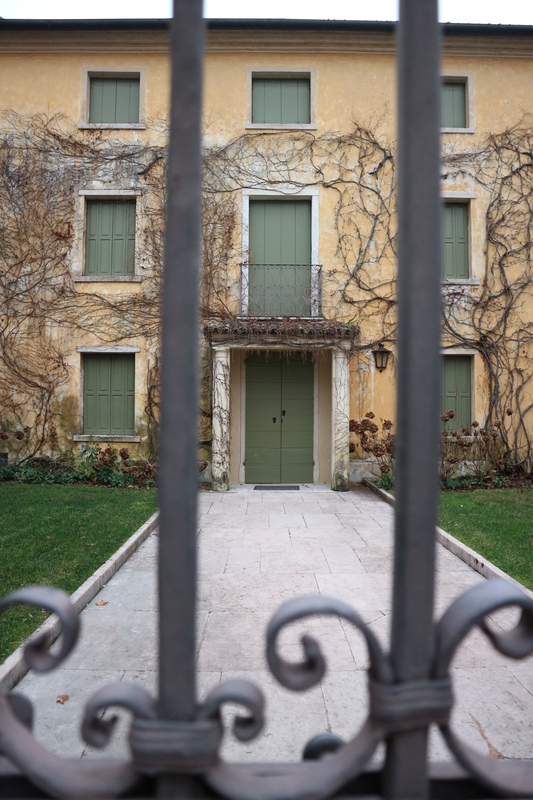 – it’s the sort of place you want to find a little table balanced on cobblestones to sit at while you drink wine, a place you’d want to visit with a sketch book and pencil, even if you can’t draw. 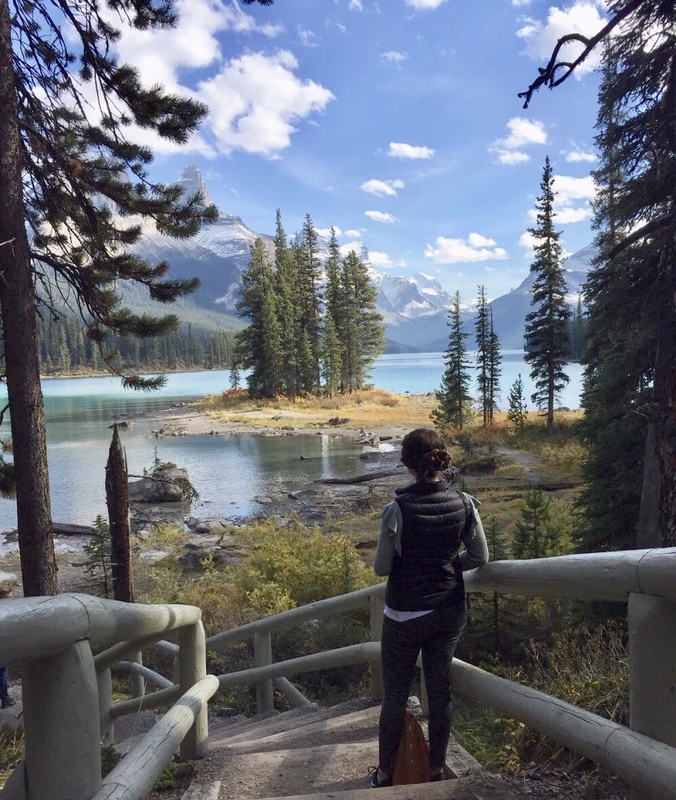 The fact that there isn’t a heap of big tourist attractions to see and do there is what makes it such a great place to visit as a break from the chaos that can be Venice. 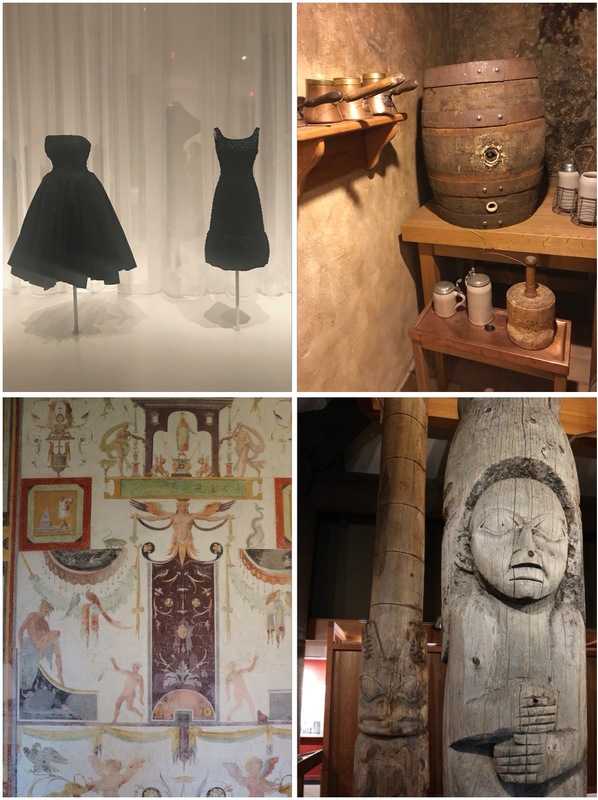 I’m a bit (a lot) of a history geek, and its International Museum Day tomorrow, so I thought I’d take a look at some of the best museums husband and I have seen on our travels. 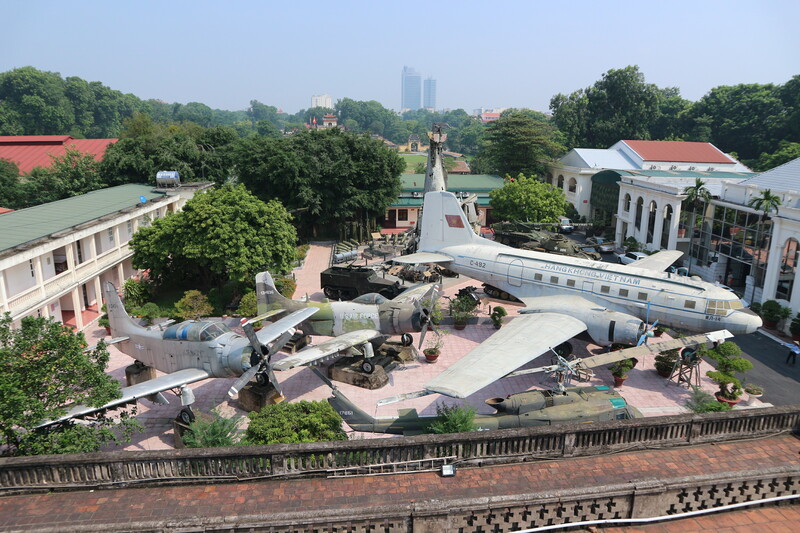 They’re an easily overlooked activity when you’re travelling because they have a reputation for being boring (probably because a lot of kids were dragged to them against their will at school), but there are soooo many different types of museums out there that are a hell of a lot more fun than what you did back in year 5! This museum looks at animals of all sorts native to the area (like elk, mountain goats, bears, wolves). 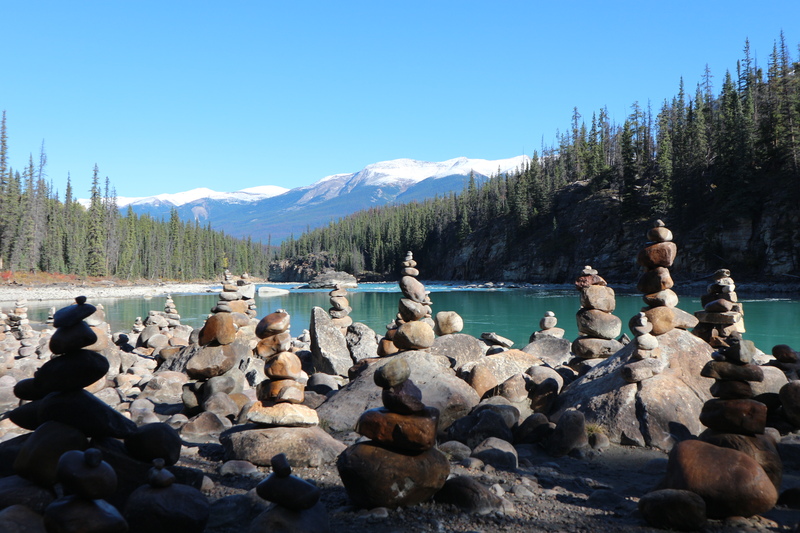 It also has some gorgeous geological displays of stones and crystals and random curiosities donated by locals. And on the way out, for bonus points, there’s a beautiful library! This was like walking through a history book in the best possible way. I learned more than expected to about Chicago’s history, random things like how the city flag came to be, and about the incredible work of Vivian Maier, which I’m not obsessed with. This old Moorish palace has been renovated and restored, and given new life as a natural history museum. A lot of the ceiling and tile details are original, and the garden (while small compared to some of the other palaces) is stunning. 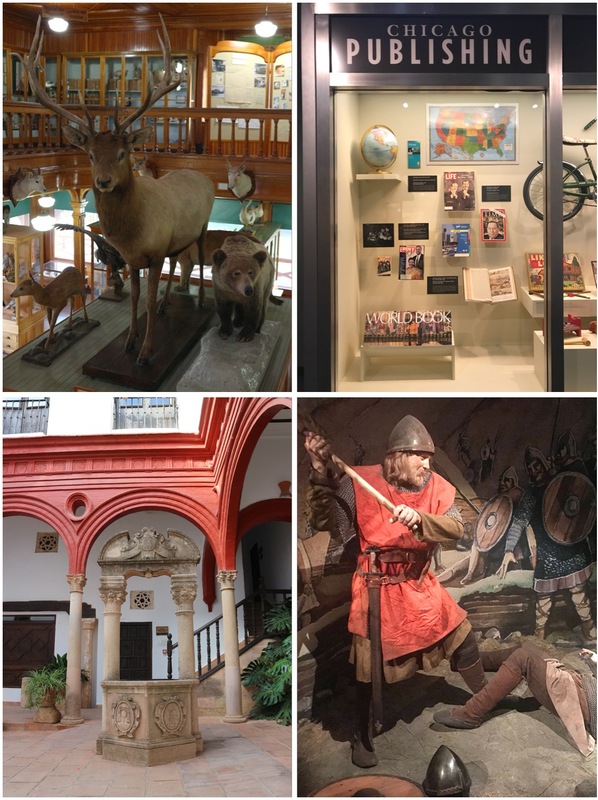 This is like a history picture book come to life – with an audio guide to talk you through, you walk through the museum’s displays of figures (all crafted based on descriptions found in the Viking sagas and chronicles), demonstrating events from Iceland’s history. I’m not a beer drinker, and I still had a blast here! Yes, you get to go through a proper tasting session, and learn how to pour the perfect pint, and enjoy said pint in the rooftop bar with a killer view over Dublin, but it’s also a multi-level museum looking at everything from the beer creation process to it’s many marketing campaigns. You can read more about our visit to Mardi Gras World here, but basically it’s a tour through one of the warehouses the Kern family use to create the incredible parades floats. You’ll get to see the props and some floats, as well as getting a peek at some of the artists at work. This is an incredibly interactive museum, encouraging visitors to open cupboards, sit in cars, and listen to the sounds coming through the headphones. You’ll get a disconcerting taste of life in war-time East Germany, including being able to walk through a full “apartment” and rifling through the kitchen, bedrooms and lounge room. Again, not a beer drinker, so this was mostly for husband’s benefit, but turned out it was a really cool little museum! It covered the history of beer, had some crazy beer collections (bottles, labels, model trucks), and at the end of the tour, you received 4 beers to sample. Not little 30ml sips, but full glasses of beer. Enjoy! 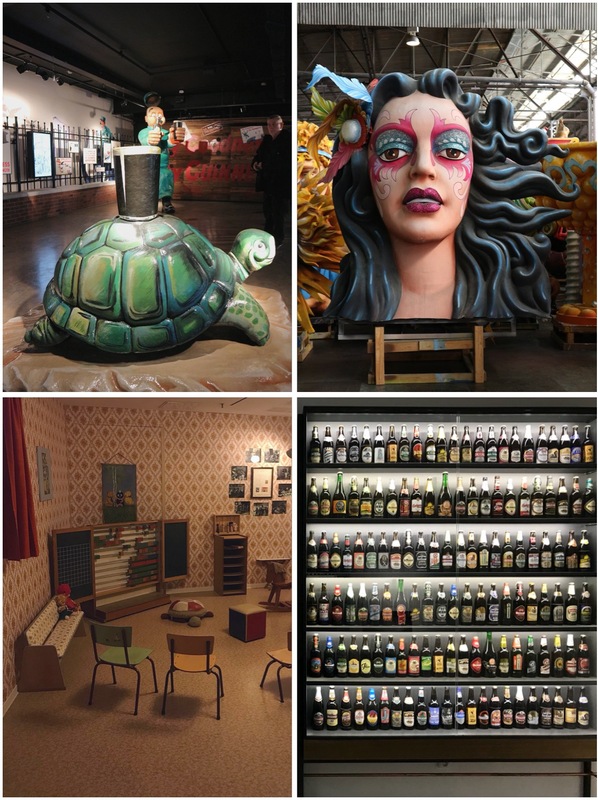 It shouldn’t need much of an introduction – this is THE place to go for art in New York. The modern exhibits change regularly, but honestly, my favourite pieces were the classics like Monet’s Water Lilies and Van Gogh’s Starry Night – you see these in magazines and art textbooks at school, but in real life, they’re something else. 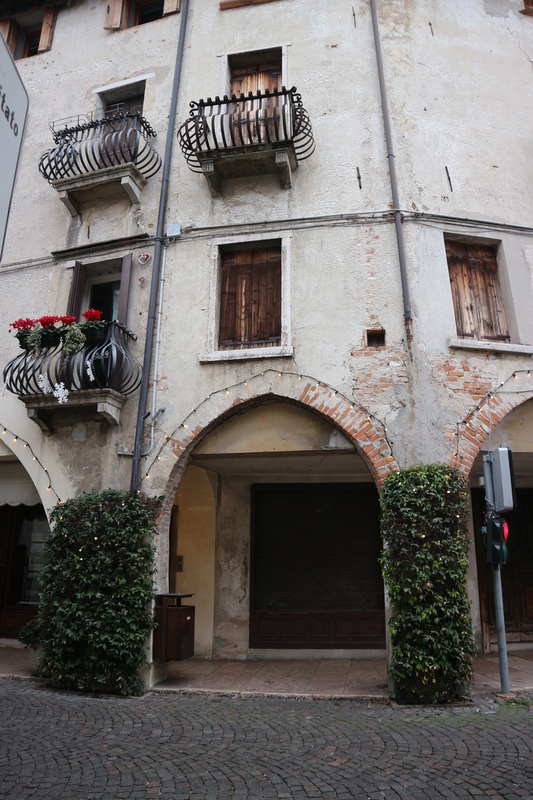 This little museum lives in an old (when I say old, I mean from the 1300s) townhouse, accessible by a 500-year old wooden staircases, over a few floors. You’ll find an impressive collection of Oktoberfest paraphernalia (mugs, posters, etc), and can sit down to watch a short film about the history of Oktoberfest. Even as a non-beer lover, this was an awesome piece of history to see. It took me three visits to Rome, but I finally got to Castel Sant’Angelo! It’s had a few lives, originally built as a mausoleum, and also serving as a fortress and castle before turning into a museum. The most stunning part of the museum are the paintings, Renaissance era frescoes, which have been preserved almost perfectly. Even if you’re not an art lover, they’re worth seeing. Speaking of worth seeing, make it all the way to the top and you’ll be rewarded with one hell of a view. It’s not a huge museum, but the history it holds is massive. It holds some of the city’s most previous totem poles, as well as other native artifacts (think intricate hand-beaded purses and ornaments). Last week I took an awesome class through Laneway Learning called The Art of Tea Brewing, Flag & Spearhosted by the lovely Cheryl from . And it got me thinking that a big reason more people probably don’t enjoy tea is because they haven’t had it made properly. There’s actually a bit more to it than pouring boiled water into a mug and throwing in a tea bag, and there’s a hell of a lot more to it than those stale black tea bags your nanna has in the back of the pantry. I thought I’d do a quick run through of a few different types of tea this morning, and how to brew them, based not only on some of what I learned last week, but also from what I’ve learned making and drinking tea around the world, so that you get the best tasting cup possible! Why drink it: For a great, caffeine-lighter alternative to coffee as a morning or afternoon pick-me-up, and for benefits that include digestive tract health and lower stress levels. Water temperature: Boiling water, 100°C. This is the exception to “it’s not all just boiling water” rule. How long to steep: Depending on how strong you like it, around 3 – 6 minutes. Favourites: Storm In A Teacup’s Breakfast Tea is my all-time go to. Also adore Fortnum & Mason’s Royal Blend for an afternoon cup, Clement & Pekoe’s Assam Leaf Corramore for a morning cup, and English Tea Shop’s Organic English Breakfast tea bags when I can’t use a teapot. Why drink it: To help with everything from oral health to anti-aging to diabetic symptom relief – it’s a versatile one. Favourites: I’ve actually never gotten into white tea, so if you have any recommendations, I’d love to know!! 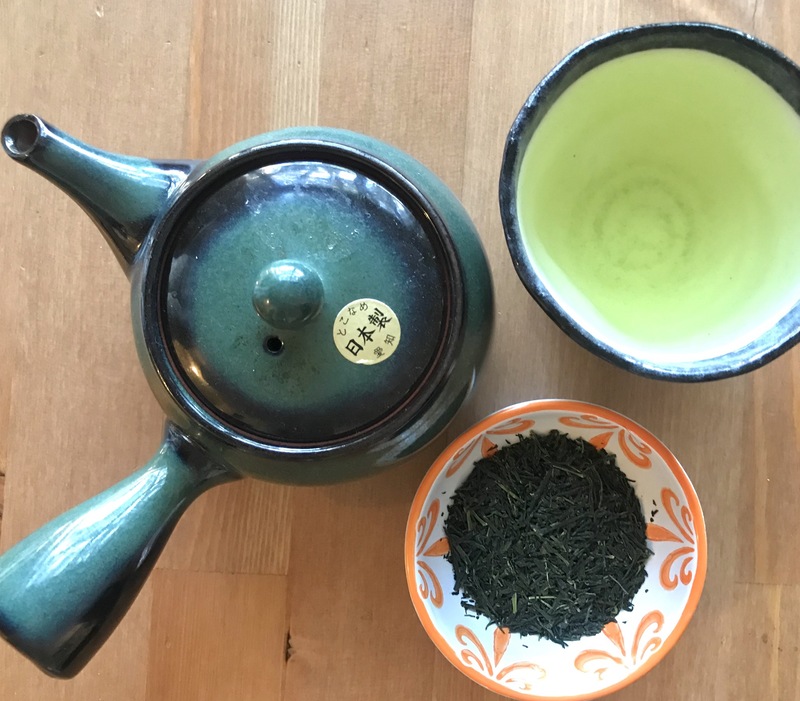 Why drink it: Green tea is packed with antioxidants, will still give you a bit of a caffeine kick, and reputedly has benefits ranging from reducing the risk of cardiovascular disease to improving brain function. Water temperature: Around 60 – 75°C. A very basic rule of thumb is to fill about a quarter of the cup or pot with cold water, the rest with boiling water. How long to steep: Again, it can vary so check the specific tea’s instructions, but generally only a minute or two, otherwise it can get quite bitter. You’ll also find some green teas can be infused two or three times, but you’ll only need 10 – 30 seconds for the second infusion. Favourites: Ippodo’s Genmaicha is a delicious blend of green tea with toasted rice, Storm In A Tea Cup’s Matcha Laced Sencha is a great way to try matcha without going the whole hog, Twining’s Lemon Drizzle is a delicious special treat cup, and my absolute favourite (and splurge purchase) tea is Ippoddo’s Mantoku Gyokuro, which is just heaven in a cup. 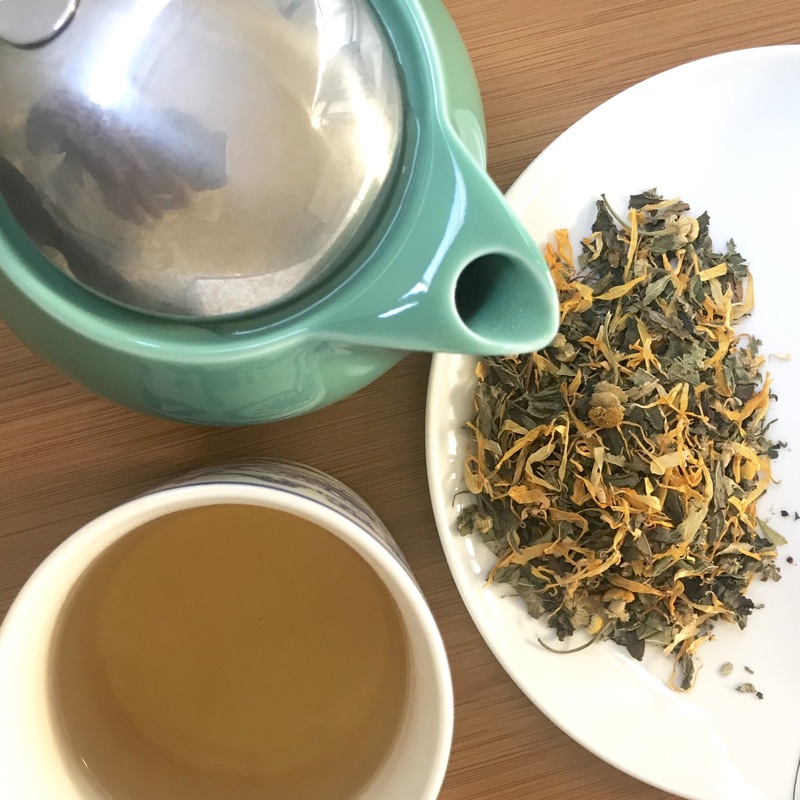 Why drink it: Because rooibos is caffeine-free, it’s the perfect option to drink at night – it’s also packed full of antioxidants, and helps support strong bones with higher levels of manganese, calcium and fluoride. Water temperature: 90 – 100°C. How long to steep: 5 – 7 minutes. 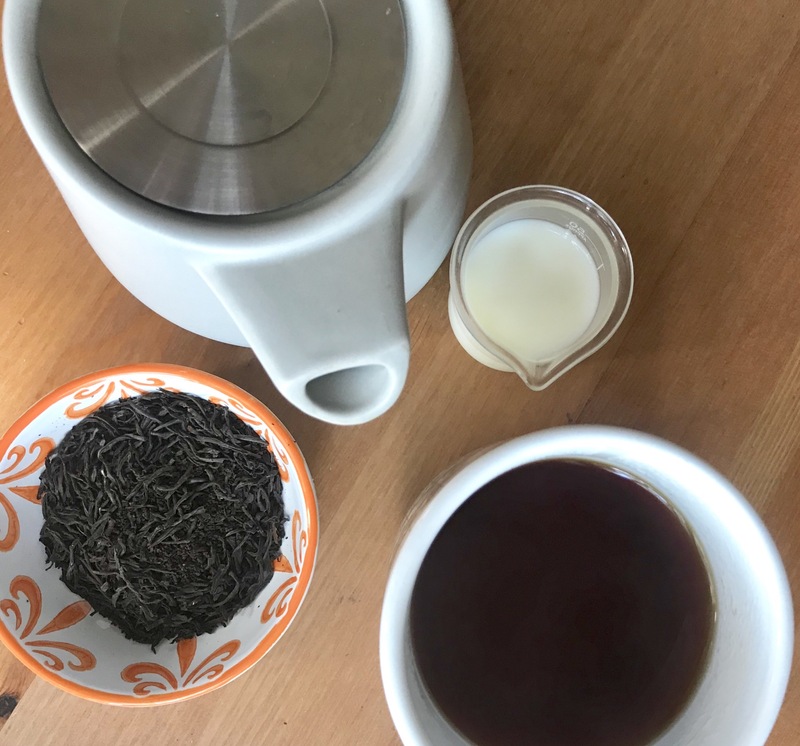 Why drink it: Not quite as high in caffeine as black tea, this drop is reported to help increase metabolism (therefore aiding in weight loss), and decreases inflammation. Water temperature: 80 – 100°C. How long to steep: 3 – 5 minutes – this is another one that can deal with multiple infusions, which are often said to get better as they go. Why drink it: Herbal tea benefits are almost unending – it all depends on what kind of herbs you go with! Herbal teas can be used to help in everything from detoxing the body from harmful nasties, helping to de-stress you before bed, assisting in healthy pregnancies and energising you before a big day. How long to steep: 5 – 8 minutes. Herbal tea is also great to cold steep for iced tea – just add cold water instead of boiling water, and steep it in the fridge overnight. Favourites: T2 Tea’s Mint Mix makes an awesome iced tea as an alternative to plain boring water, Yarra Valley Chocolaterie’s Cocoa Tea Relax is a delicious dessert tea, and Monique’s Apothecary’s detox.me is amazing to help get your liver and kidneys working properly again. And if you’d like some more tea-related business this cold, foggy Melbourne morning, we’ve got tea-infused porridge to make at home, matcha magic cake for dessert, some great winter teas, and my favourites from around the world! Here in Australia, this weekend we’ll be celebrating Mother’s Day. And being a mum to two little fur babies who aren’t capable of making me breakfast in bed, I’ll be making my own. I saw this recipe aaaaages ago on Namiko’s blog, JUST ONE COOKBOOK, and saved it with every intention of making it ASAP. And then, of course, I promptly forgot about it. Because, life. I actually haven’t been baking much lately, but I’d to try and get back into it a little, and Nami’s recipe looked like the perfect place to start. I adapted it to make it a sweet bread rather than a savoury, because treat yoself. 1. Pour the milk into a small saucepan and warm over very low heat – more than lukewarm, but not so hot it burns your finger when you test it. 2. Combine the flour, salt, baking powder and sugar in a large bowl, and set aside. 3. Beat the eggs with an electric mixer on medium speed for a few minutes, until paler and frothy/foamy. 4. Then turn the speed to low and slowly add the warm milk as you continue to mix. 5. Next, add the flour mixture, a spoonful at a time, and beat on medium speed for another few minutes, until well combined. You may need to scrape the sides of the bowl down if the flour starts the build up. 6. Now the easy part – set the batter aside to rest at room temperature for an hour. 7. When you’re ready to bake, preheat the oven to 230°C and place 8 extra large silicon cupcake cases on an oven tray. You can purchase popover pans online or use large muffin trays, but this mixture is sticky and the silicon cases are WAYYY easier to clean up! 8. Fill the cases almost to the top, and bake at 230°C for 15 minutes. Then, turn the temperature down to 190°C and bake for a further 30 minutes. Pop them out of the cases, smother them in butter or jam or cream or whatever else you’re feeling, and enjoy! 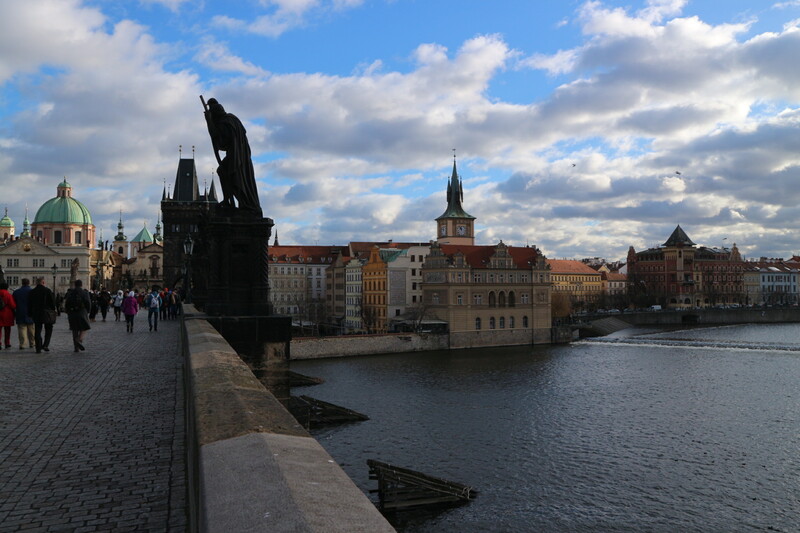 I want to give you a bit of a different post about Charles Bridge. One that I came across in my pre-trip reading. See, for the 12 months leading up to our world tour, I read as many books as I could fit in about the places we’d be visiting. Yes, by choice. Yes, I enjoyed history and English at school. 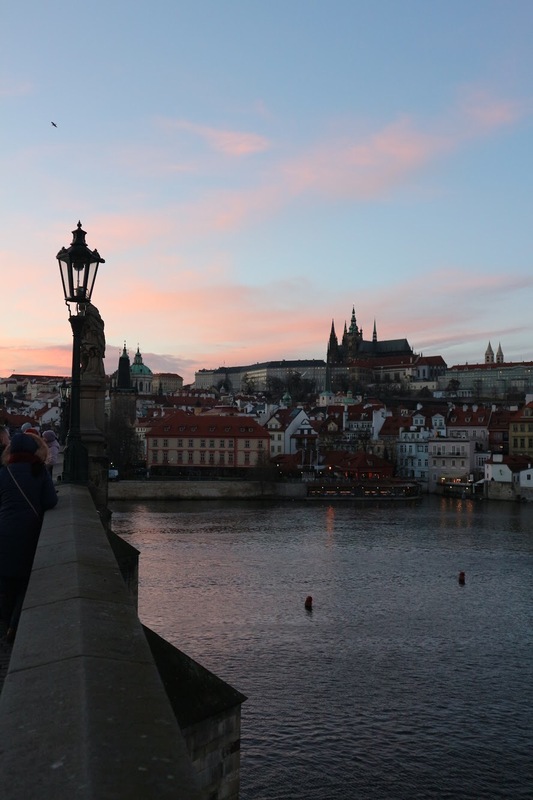 In the winter of 1342 the Bridge of Judith was destroyed by the floods, and for a time a temporary wooden bridge, partly founded on the remaining pillars of the stone bridge, alone connected the two parts of Prague. 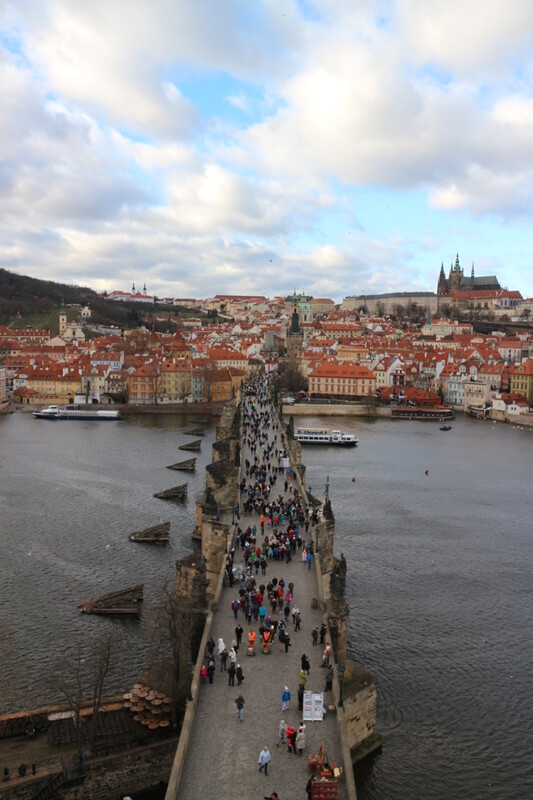 This bridge naturally proved insufficient, particularly after Charles IV. had founded the new town of Prague. 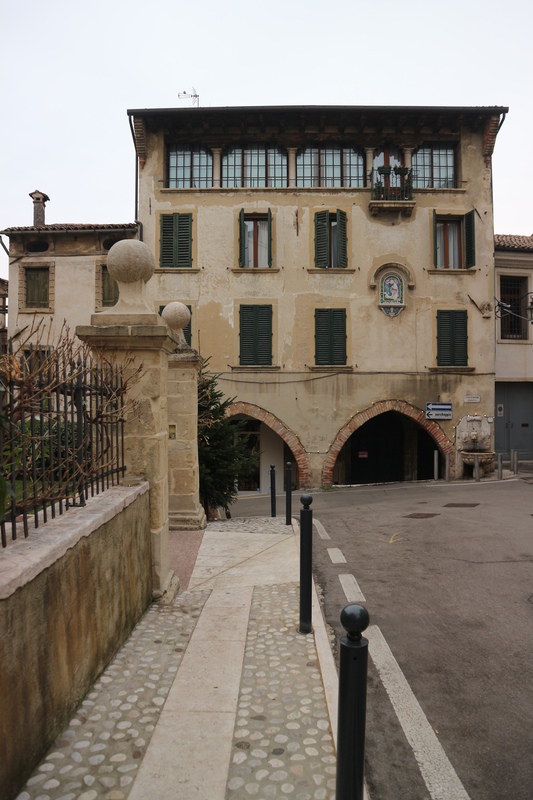 In 1357 that King undertook the building of the present bridge. It was… only completed in 1503. 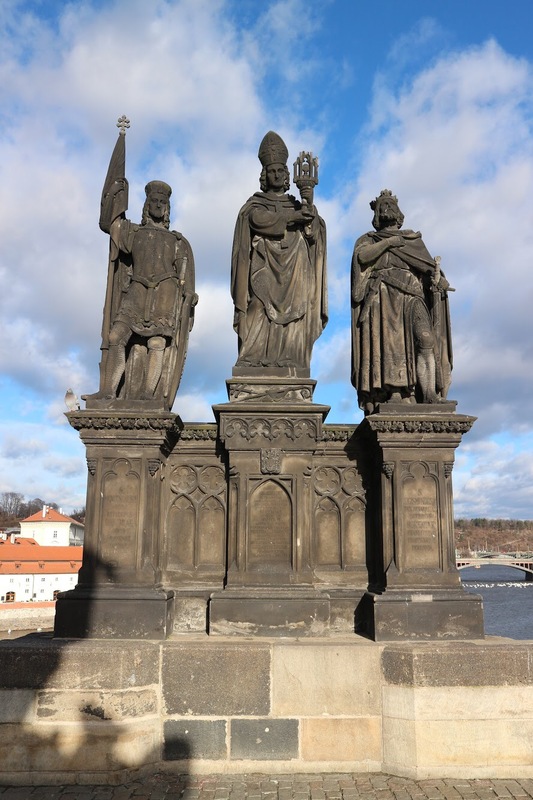 We first pass under the bridge tower of the old town, which is decorated with statues of the Bohemian patron saints and with the coats of arms of the countries that were formerly connected with Bohemia as well as that of the old town itself. 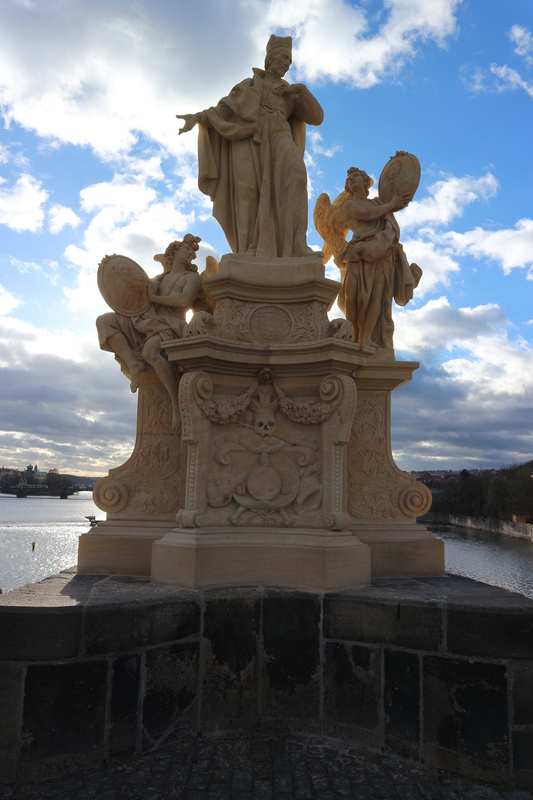 The statues that now ornament the bridge formed no part of the original structure. As can be seen in ancient engravings, a crucifix only stood on the bridge at first. Rudolph erected statues of the Madonna and of St. John, and the others were gradually added, principally during the period of Catholic re-action in the seventeenth and eighteenth centuries.